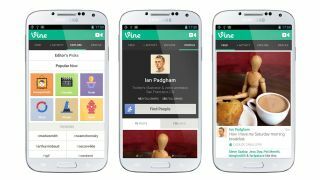 Vine for Android has finally gone live on Google Play. Twitter's 6-second clip sharing service has already snared 13 million iOS users since its launch on the App Store in January, and is now available on any device running Android 4.0 and above. We say any device... the app can so-say be downloaded from this page on Google Play, though technical demons and/or an embarrassing foul-up means the link wasn't working for about an hour after the official Vine blog announced the availability - perhaps ze bosses at Twitter 'av been drinking too much Vine? The app page is at least accessible now, but some users are finding they can't yet install it - see how you get on. The service allows you to record and share 6-second video clips but after an initial flurry of popularity, it doesn't seem to be doing too well in terms of activity.